Whether you're throwing a summer soiree or enjoying a quiet evening in the garden, this solar-powered Japanese lantern will add just the right amount of light and atmosphere. 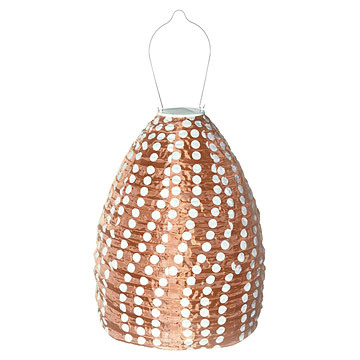 Simply hang this polka-dot lantern outside in direct sunlight and in four hours, it will be fully charged for an evening of soft, glowing light. A protective coating on its wire frame guards against mold and mildew, and the lantern will retain its shape and color through rain or snow. Made in China. For full charge: Place the lantern in direct sunlight for 4 hours to create 4-6 hours of glow time. A full day in direct sunlight could lead to a full night of glowing. Click here to see it glowing. Care instructions: Designed for year round outdoor use. Wipe clean with wet cloth. No solvents. This was a gift for my mom and she loves it. Apparently it stays glowing for a long time too. Nice glow in the evening! Cute item! It was easily put together and then hung outside. It throws off a nice glow each evening. The area is not pitch dark without the lantern as there is a street light nearby, but I DO enjoy seeing it glow. Though this beautiful lamp doesn't put off a lot of light, the attractive design and graceful movements more than make up for it. Dimly lit lanterns hung in the backyard are beautiful, even if they don't light the walkway. I also have the black and white lantern, which puts out a lot more illumination. In the winter I hang these under the bedroom track lights, and they glow pleasantly after dark. Lightweight and easy to move around. This product was very attractive, but it solar panel isn't big enough to make it work. I ordered 1 and it didn't work so they sent me another one and that one didn't work either. [...]. We purchased it as a birthday gift and we know she will love it! This lamp is gorgeous. I got another design and liked it so much that I ordered this one as well. They charge from the sun or a lamp, and then emit a soft glow for hours afterward -- not enough to read by, but absolutely lovely. The light is just as advertised--it provides a glow to any space. I'm using it on my outdoor patio. And for those purchasers who said that the solar panel was on the bottom of the lamp, you've got the lamp upside down (I almost did the same, but the directions make it clear which way is up). The solar panel is right on the top of the lamp, so it recharges easily. These lamps are perfect for sunny places like Arizona! Doesn't project a lot of light, but wasn't expecting to use it as only source of illumination. It's a nice addition of ambiance to kids room or deck. The recharge unit is same as the landscaping lights you can get at [...] for $1.25, then wrap that with some nice fabric and wire (as a designer not sure I buy the year round outdoor use claim). This is a nice, stylish lamp, but if I saw this in a store where I could hold it in my hands, I wouldn't even buy this at half the price based on the materials and build. Nice lamp, wrong price point. These solar-powered lanterns are a brilliant idea. They're also well designed. My only complaint is that they need direct sunlight most of the day to get even the limited amount of illumination that they produce at their maximum charge. The best way to get this is to turn them upside down (exposing the solar panel) in a place that remains sunny all day. My original desire was to hang them up and not worry too much about them, which may be possible if you have an excessively sunny porch. Once charged the lantern produces a blue-tinted light that is pretty, but not enough to illuminate an area for use.